J is vivacious, hilarious, and loves to teach outside of the box. She was a part of my cohort during my graduate studies here in Korea, and we have been bonding while pulling out our hair ever since (the hair pulling has been way less frequent since we have both received our masters^^). I always looked forward to her presentations during class, and I hope she considers writing more guest blog posts for us in the future. Love you J! Fall is here and I am ecstatic for two reasons: I can finally wear my extensive collection of hoodies, and National Novel Writing Month (NaNoWriMo) is right around the corner. 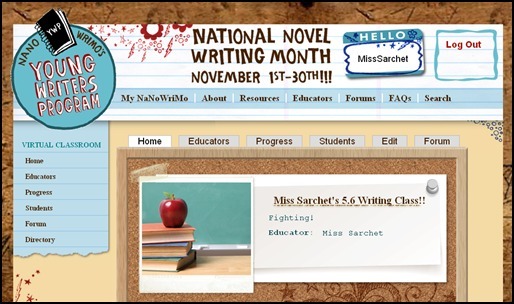 In November, I’ll be both writing a novel and guiding my 5th and 6th grade students in their own literary pursuits. This time last year, I was scared to attempt this with my students. But I made the decision to jump in with both feet, and I’m so glad I did. Every year since 1999, thousands of writers all over the world pen 50,000 word novels in just 30 short days. I have participated since 2006 on my own, but in 2011, I had the opportunity to get my students involved, too. The organization that runs NaNoWriMo—the Office of Letters and Light—has a special program called Young Writers Program (YWP) which encourages students from Kindergarten through high school to also write novels in November. 1) Students choose a word-count goal, which can range from 20 to 30,000 words (or more!) depending on their age, writing ability, and time they can commit. 2) Students write their novels, by hand or on a computer, in any language. They may start on November 1st (no starting early!) and must stop on November 30th. 3) It is not a contest, so there are no prizes and there are no winners. Everyone who reaches their word count goal is considered a winner. 4) Students can receive 5 copies of their book for free, as generously provided by sponsors of the event. Twenty-two students—mostly boys—signed up. They sacrificed their recess time to meet daily. I witnessed what every writing teacher dreams of: students that are passionate about and committed to writing. Their eyes shone with excitement as they described their stories, and they gushed about the worlds they had created and the characters that lived there. They pulled at their hair when the perfect word was on the tip of their tongues, encouraged one another to keep going, and counted each of their words with pride. And when NaNoWriMo was over, we all celebrated with a pizza party. Without a doubt it had been a success, but what I couldn’t have anticipated was the lasting effect NaNo would have on my students. Although all but two students made the choice to write in Korean, the confidence, passion, and commitment has transferred to their English writing assignments. Although it may seem daunting at first, I guarantee that this is an experience you don’t’ want to miss out on. The site has TONS of resources for teachers (virtual classroom, forums, lesson plans, downloadable workbook, classroom starter kits, and more!) and the reward is so worth it. Students busy writing, such joy! Do it!!! I tried this with my students and learned so much more about teaching writing, mainly giving students time to write. And, then I grew myself as a writer. It is an amazing challenge…and this year I’m looking forward to novel number 4.